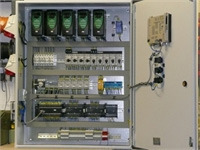 Distributor of programmable logic controllers-high performance mpu, radio frequency identification etc. EH22 series is well equipped with outstanding operational speed, large programming capacity and built in application and communication instructions, multiple special extension modules and function cards, enabling the efficiency of the MPU to be utilized to its fullness. 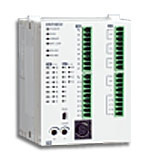 ‧communication port: built-in RS-232 and rs-485, compatible with modbus ascii / rtu communication protocol. EC3 series is the most economical solution for sequential control and communication monitoring and can operate independently, allowing the user to achieve stand-alone monitor, E. G. Monitoring phototransistor coupler, proximity switch, optical sensor, indicator and illumination switch. Through serial ports, EC3 is able to connect to control devices such as plc, frequency inverter and temperature controller, which can be said to be a programmable application solution that is cost-friendly and highly reliable. 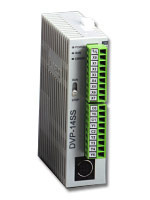 the left-side parallel high speed extension interface on SV series is able to connect to all kinds of network interface, E. G. Ethernet, devicenet, profibus, analog and temperature modules for the demand of immediate control. 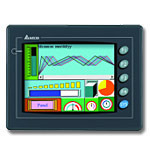 16 special extension modules (digital, analog, axis control, communication, etc. ) are connectable to SV series (8 on the left and 8 on the right). 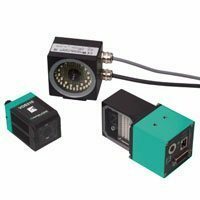 The built-in 200KHZ 4-axis independent pulse output and the featured 2 groups of linear/arc interpolation motion control instructions offer an easy positioning control solution. This series is specially designed for practical usage and it can meet the general requirement of the user. Currently, we provide the models of 8" and 10.4" display with multiple colors. Some applications place particularly high demands on the robustness of sensors. 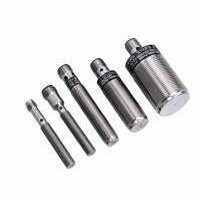 These rugged and durable "Metal Face“ sensors are enclosed in stainless steel making them the best selection for these tough applications. Applications such as machine tools or metal processing will often expose the sensor to target impact, abrasion and the affects of aggressive solvents and fluid. In these applications, sensors with astainless steel sensing face may reduce down time and extend service-life making your overall production more profitable. Inductive analog output sensors are used to detect metal objects within specific operating ranges. This object distance is then translated into an analog output signal proportional to distance, making these sensors ideally suited for measuring and control applications. 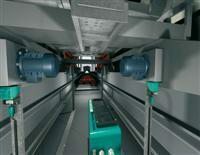 The pepperl+fuchs product offering includes operational detection ranges from 25 mm, 38 mm, and 1540 mm. 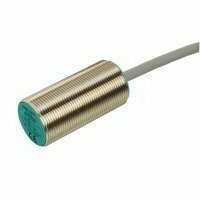 Due to the low temperature deviation of our inductive analog sensor product, only 1/1000 of the final value per degree celsius, the sensor remains reliable and accurate even under non-constant ambient conditions. In multiple sensor applications, a communications network often connects sensors so that system coordination can be accomplished. 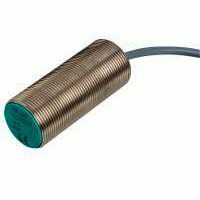 We offer a line ofintelligent proximity sensors that extend their functionality to include supply line monitoring, diagnostics and network communication with a programmable logic controller. Using our AS-interface proximity sensors the user can network up to 31 (specification 2. 0) or 62 (specification 2. 1) proximity switches per master. 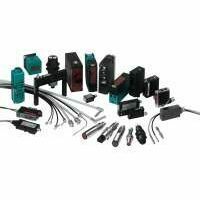 Pepperl+fuchs offers a wide range of photoelectric sensors, fiber optic cables, & accessories. 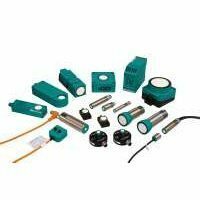 We have the photoelectric sensors you need to keep your applications running. Pepperl+fuchs with the brand visolux is an innovator of photoelectric sensing technologies. For precise, optical control of positioning, sorting, and counting processes and for custom non-standard applications, look to pepperl+fuchs to have the answers for every industry. Ultrasonic sensors present the ideal solution for non-contact position and distance measurement in all industrial areas where environmental conditions such as dust, smoke or steam may affect the sensors. Objects consisting of a variety of materials can be detected to within millimeters regardless of color or shape. The ultrasonic sensor produces a data carrier utilizing very high frequencies that are outside the human’s audible range. The time it takes for that ultrasonic wave to pass between the sensor and the object is the value for the distance or the position. Ultrasonic sensors have proven their reliability and precision in many industries, including lumber and furniture, construction materials and equipment, farming equipment and in level control applications. 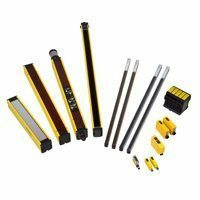 Pepperl+fuchs’ ultrasonic sensors currently encompass twelve series of mechanical designs for through-beam, direct detection and retro-reflective operation. Customer and application specific custom solutions underscore our technological competence in this area of sensors. Years of experience in industrial sensor technology and factory automation make pepperl+fuchs your specialist foridentification systems. Pepperl+fuchs identification systems make the acquisition of information in production and logistics more cost-efficient, and enhance the quality of the information. You have a constantly updated display of inventory, while benefiting from comprehensive tracking and tracing options. Your access for the control of all material flows is also improved. And because the process data available to you is so accurate, you can continuously improve processes, enabling you to raise the bar in terms of delivery reliability and inventory management. Transponders can be read or written to. Data transfer takes place via UHF,microwave or electromagnetic induction. Robust and chemically-resistant transponders can be used in harsh industrial environments. Pepperl+Fuchs products allow you to install inductive RFID systems with frequencies of125 kHz, 250 kHz, 13.56 MHz and 868 MHz, as well as microwave systems of 2.45 GHZ. These systems provide a broad spectrum of ranges, transfer rates and designs, meaning that you can custom-implement according to your requirements. Object information is stored as abarcode or two-dimensional code. It is read via laser or digital photo technology. Barcode and data-matrix systems represent a cost-effective alternative to RFID technology. Common barcode and data-matrix code carriers are not as robust as RFID transponders. 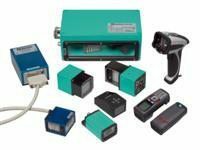 Pepperl+Fuchs provides a wide variety of barcode scanners and data-matrix read devices. The OIT High Temperature IDENT System from Pepperl+Fuchs is completely different: Its preferred applications are in drying plants and coating lines. The OIT High Temperature IDENT System uses metal plates with a perforated matrix, which are evaluated via industrial image processing. As one of the few suppliers of industrial vision systems, we can accommodate a wide variety of image processing requirements for machine builders as well as for unique system solutions in plant engineering. We offer integrated vision sensor solutions that range from freely programmable devices to user-specific, custom-designed devices. For individual systems with demanding requirements, we provide customer-specific system solutions through our subsidiary, VMT gmbh. Our partnership with VMT enables pepperl+fuchs to offer the whole range of industrial image processing from vision sensors via smart cameras to a complete system. In order to achieve the required level of safety when people or parts of their bodies approach a hazard, non-contact protective systems are the first choice. photoelectric sensors are used to fulfill protective measures, especially when the freedom of movement cannot be limited by other types of protection. 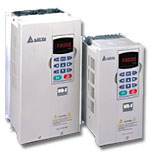 The EX series is the analog MPU with the lowest cost. Apart from supporting digital input and output, the EX series has built-in multiple analog I/O channels and integrates a variety of communication protocol’s for constructing a complete control network. 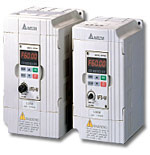 EX series is suitable for all kinds of small PLC applications. 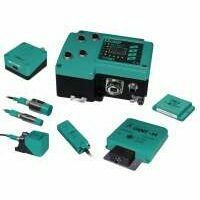 ‧High-speed pulse output: Supports 2-point (Y0, Y1) independent high-speed pulse output of up to 10KHz. Compared to other slim and compact Delta PLC's, the SC series is the best MPU for motion control because of better high-speed pulse output and pulse counting functions. ‧High-speed pulse output: Supports 2-point (Y10, Y11) independent high-speed pulse output of up to 100KHz (total bandwidth: 130KHz). ‧Supports handy position control instructions. By ZRN (zero return), DRVA (absolute position) and DRVI (relative position) instructions, SC series is able to complete all kinds of motion controls by working with Delta servo. 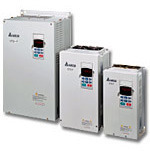 Compared to the standard Delta PLC, the slim and compact SA series offers larger program capacity and operation efficiency. 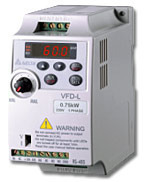 ‧High-speed pulse output: Supports 2-point independent high-speed pulse output (Y0 of up to 50KHz and Y1 of up to 10KHz). 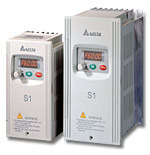 The slim and compact SS series offers the easiest and basic functions for sequential control. The extension DIO modules enable your HMI to be an all-in-one, and cost-effective controller with excellent control performance for display, control and operation by working with HMI-WPLSoft program built in Delta Screen Editor software. 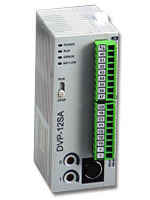 The extension Ethernet module helps your HMI to connect to peripheral devices and configure the network connections of your system. The transmission distance will be no longer limited. It supports the Modbus TCP/IP protocol. The Steward Uniforms are accurately designed, seamlessly stitched, durable and stands high on quality. Tailored as per client specifications and designs, these are sweat resistant and are comfortable to wear. Our uniforms are stringently tested for rendering maximum comfort to the end users.